Thoth is one of the earliest Egyptian Gods, said to be self-created at the beginning of time, along with his wife Ma’ at (truth). 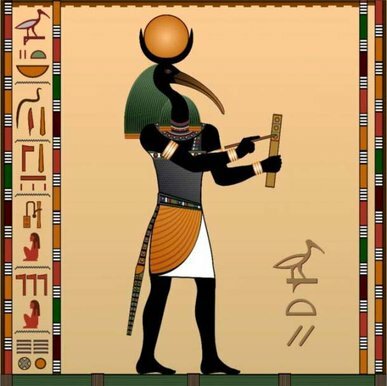 One legend is that Thoth in his form as an Ibis, laid an egg from which Ra, the Sun was born. Thoth is also associated with the Moon because the beak of an Ibis resembles the crescent Moon. Thoth is described as an ibis- headed human, an ibis or a baboon. He carries a pen and a scroll to record all things. Thoth was also thought to have invented writing, medicine, magic, and the Egyptian´s civil and religious practices. As the scribe of the Underworld, he records the verdict on the deceased in the hall of Ma’at and was called “He who Balances", "God of the Equilibrium" and "Master of the Balance". In His role as “The Councilor of Ra” Thoth along with Ma’at stands on either side of Ra in his boat as it travelled across the sky, directing the course of the sun boat. Thoth is credited with writing the Egyptian "Book of the Dead" and "Book of Breathings". There is also a myth about the mysterious “Book of Thoth” which contains every secret of the universe. Anyone who reads it would become the most powerful magician in the world, but would also be cursed by the knowledge. Some theories have it that the book is hidden somewhere inside the Great Pyramid, and that Thoth and the other Egyptian Gods were from Atlantis. As a master of the magickal arts, Thoth is credited with inventing the Tarot which has also been called “The Book of Thoth”. With the help of Anubis, he used his magickal knowledge, to help Isis resurrect Osiris by creating the very first mummification ritual. Thoth protected Isis’s son Horus with a magick potion that he created from his own body. As master of time, Thoth is credited with creating the 365-day calendar (which replaced the inaccurate 360 day calendar). He earned the extra days by gambling with the Moon. He measures and records time and is called "the Reckoner of Time and of Seasons". To create an Altar to Thoth use lunar shaped candles and charms and decorate it with images of ibises and baboons.